Why Safe Voluntary Euthanasia is a Myth - by Brian Pollard. Ian Haines, a medical oncologist, writes why he believed that euthanasia was the only humane solution. Now he no longer believes that. It is widely believed that there are only two options open to patients with terminal illness: either they die slowly in unrelieved suffering or they receive euthanasia. In fact, there is a middle way, that of creative and compassionate caring. Meticulous research in Palliative medicine has in recent years shown that virtually all unpleasant symptoms experienced in the process of terminal illness can be either relieved or substantially alleviated by techniques already available. This has had its practical expression in the hospice movement, which has enabled patients symptoms to be managed either at home or in the context of a caring in-patient facility. It is no surprise that in the Netherlands, where euthanasia is now accepted, there is only a very rudimentary hospice movement. By contrast, over in the UK, which has well developed facilities to care specifically for the terminally ill, a House of Lords committee ruled that there should be no change in the law to allow euthanasia. This is not to deny that there are many patients presently dying in homes and hospitals who are not benefiting from these advances. There are indeed many having suboptimal care. This is usually because facilities do not exist in the immediate area or because local medical practitioners lack the training and skills necessary to manage terminally ill patients properly. The solution to this is to make appropriate and effective care and training more widely available, not to give doctors the easy option of euthanasia. A law enabling euthanasia will undermine individual and corporate incentives for creative caring. A patient with a terminal illness is vulnerable. He lacks the knowledge and skills to alleviate his own symptoms, and may well be suffering from fear about the future and anxiety about the effect his illness is having on others. It is very difficult for him to be entirely objective about his own situation. Those who regularly manage terminally ill patients recognise that they often suffer from depression or a false sense of worthlessness which may affect their judgment. Their decision-making may equally be affected by confusion, dementia or troublesome symptoms which could be relieved with appropriate treatment. Patients who on admission say 'let me die' usually after effective symptom relief are most grateful that their request was not acceded to. Terminally ill patients also adapt to a level of disability that they would not have previously anticipated they could live with. They come to value what little quality of life they have left. Many elderly people already feel a burden to family, carers and a society which is cost conscious and may be short of resources. They may feel great pressure to request euthanasia 'freely and voluntarily'. These patients need to hear that they are valued and loved as they are. They need to know that we are committed first and foremost to their well-being, even if this does involve expenditure of time and money. The way we treat the weakest and most vulnerable people speaks volumes about the kind of society we are. One of the major driving forces behind the exceptional medical advances made this century has been the desire to develop treatments for previously fatal illnesses, and the eagerness to alleviate hitherto unmanageable symptoms. Medical research is essential if medicine is to advance further. When the focus changes from curing the condition to killing the individual with the condition, this whole process is threatened. The increasing acceptance of prenatal diagnosis and abortion for conditions like spina bifida, Down's syndrome and cystic fibrosis is threatening the very dramatic progress made in the management of these conditions, especially over the last two decades. Rather than being employed to care and console, funds are being diverted to fuel the strategy of 'search and destroy'. If euthanasia is legalised we can expect advances in ktenology (the science of killing) at the expense of treatment and symptom control. This will in turn encourage further calls for euthanasia. 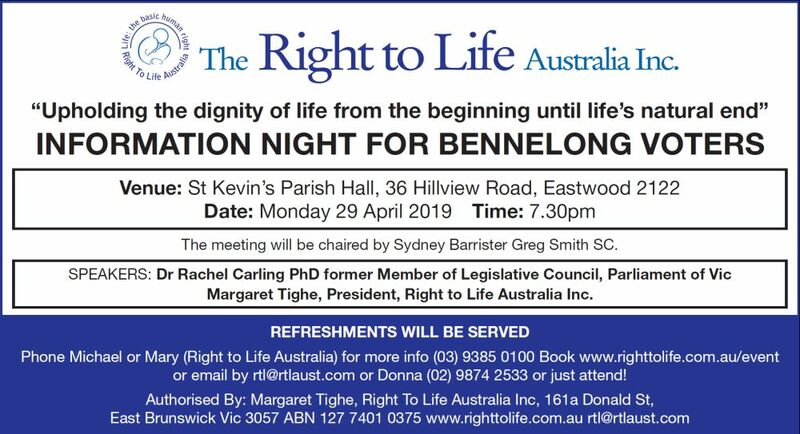 Legalisation of euthanasia is usually championed by those who have witnessed a loved one die in unpleasant circumstances, often without the benefits of optimal palliative care. This leads to demands for a 'right to die'. In reality the slogan is misleading. What we are considering is not the right to die at all, but rather the right to be killed by a doctor; more specifically we are talking of giving doctors a legal right to kill. This has its own dangers which we shall consider shortly. Allowing difficult cases to create a precedent for legalised killing is the wrong response. We need rather to evaluate these difficult cases so that we can do better in the future. This was clearly demonstrated in the case of Nigel Cox, a rheumatologist found guilty of attempted murder after giving a patient with rheumatoid arthritis a lethal injection of potassium chloride in August 1991. Had he been willing to consult those specialised in pain management, he could have relieved his patient's symptoms without killing her. If errors of omission are acknowledged, changes can be made. The European Association for Palliative Care registered its strong opposition to the legalisation of euthanasia. If care is aimed at achieving 'the best possible quality of life for patients and their families' by focusing on a patient's physical, psychosocial, and spiritual suffering, requests for euthanasia are extremely uncommon. The answer is not to change the law, but rather to improve our standards of care. Autonomy is important. We all value the opportunity of living in a free society, but also recognise that personal autonomy has its limits. Rights need protection, but must be balanced against responsibilities and restrictions if we are to be truly free. We are not free to do things which limit or violate the reasonable freedoms of others. No man is an island. No person makes the decision to end his or her life in isolation. There are others who are affected: friends and relatives left behind, and the healthcare staff involved in the decision-making process. Western society no longer recognises suicide as a crime, but still appreciates that a person's decision to take his or her own life can have profound, often lifelong effects on the lives of others. There may be guilt, anger or bitterness felt by those left behind. Personal autonomy is never absolute. The effect of personal decisions on others now living or in future generations must also be considered. Once voluntary euthanasia is legalised in a single country or state, people from neighbouring constituencies will take advantage of it. In this way no territory can act in isolation. The decisions we make have implications for other nations, not only for their citizens who choose 'euthanasia tourism' but also for future changes in their own laws. Any state considering a change in its laws in this regard has a responsibility not just to its own citizens but to the whole international community. 'My underlying motive was the desire to help individuals who could not help themselves... such considerations should not be regarded as inhuman. Nor did I feel it in any way to be unethical or immoral... I am convinced that if Hippocrates were alive today he would change the wording of his oath... in which a doctor is forbidden to administer poison to an invalid even on demand... I have a perfectly clear conscience about the part I played in the affair. I am perfectly conscious that when I said yes to euthanasia I did so with the greatest conviction, just as it is my conviction today that it is right'. He sincerely believed he was innocent. This demonstrates that once doctors start killing, it is possible for them to carry on doing it without feeling any guilt. Traditional medical ethical codes have never sanctioned euthanasia, even on request for compassionate motives. The Hippocratic Oath states 'I will give no deadly medicine to anyone if asked, nor suggest such counsel....' The International Code of Medical Ethics as originally adopted by the World Medical Association in 1949, in response to the Nazi holocaust, declares 'a doctor must always bear in mind the obligation of preserving human life from the time of conception until death'. In its 1992 Statement of Marbella, the World Medical Association confirmed that assisted suicide, like euthanasia, is unethical and must be condemned by the medical profession. When a doctor intentionally and deliberately enables an individual to end his life, the doctor acts unethically. Calls for voluntary euthanasia have been encouraged either by the failure of doctors to provide adequate symptom control, or by their insistence on providing inappropriate and meddlesome interventions which neither lengthen life nor improve its quality. This has understandably provoked a distrust of doctors by patients who feel that they are being neglected or exploited. The natural reaction is to seek to make doctors more accountable. Ironically, voluntary euthanasia legislation makes doctors less accountable, and gives them more power. Patients generally decide in favour of euthanasia on the basis of information given to them by doctors: information about their diagnosis, prognosis, treatments available and anticipated degree of future suffering. If a doctor confidently suggests a certain course of action it can be very difficult for a patient to resist. However it can be very difficult to be certain in these areas. Diagnoses may be mistaken. Prognoses may be wildly misjudged. New treatments which the doctor is unaware of may have recently been developed or about to be developed. The doctor may not be up-to-date in symptom control. Doctors are human and subject to temptation. Sometimes their own decision-making may be affected, consciously or unconsciously, by their degree of tiredness or the way they feel about the patient. Voluntary euthanasia gives the medical practitioner power which can be too easily abused, and a level of responsibility he should not rightly be entitled to have. Voluntary euthanasia makes the doctor the most dangerous man in the state. When voluntary euthanasia has been previously accepted and legalised, it has led inevitably to involuntary euthanasia, regardless of the intentions of the legislators. According to the Remmelink Report, commissioned by the Dutch Ministry of Justice, there were over 3,000 deaths from euthanasia in the Netherlands in 1990. More than 1,000 of these were not voluntary. Other assessments have been far less conservative, and these figures pre-date February 1994 when euthanasia in that country was effectively legalised. Holland is moving rapidly down the slippery slope with the public conscience changing quickly to accept such action as acceptable. The Royal Dutch Medical Association (KNMG) and the Dutch Commission for the acceptability of life terminating Action have recommended that the active termination of the lives of patients suffering from dementia is morally acceptable under certain conditions. Two earlier reports of the commission affirmed the acceptability of similar action for severely handicapped neonates and comatose patients. Case reports include a child killed for no other reason than it possessed abnormal genitalia and a woman killed at her own request for reasons of 'mental suffering'. Such a progression requires only four accelerating factors: favourable public opinion, a handful of willing doctors, economic pressure and a law allowing it. In most Western countries the first three ingredients are present already. When legislation comes into effect, and political and economic interests are brought to bear, the generated momentum can prove overwhelming. History has shown clearly that once voluntary euthanasia is legal, involuntary euthanasia inevitably follows. International Code of Medical Ethics adopted by 3rd World Medical Assembly,London, England, October 1949. Sheldon T (1994) Judges make historic ruling on euthanasia. BMJ 309:7-8. Dutch doctors pushed on to 'slippery slope' over euthanasia. The Independent Wednesday 17 February 1993 p8.